Here is a picture of my match unit. (1959) Williams golden bells. There should be 20+ wires. One set for the match and one set for the lights. No second coil. It is basically a continuous stepper. (always going the same direction). The numbers in match unit schematic refer to backbox match feature 0-9 lamps. Score unit has some switches (for "0" and "9" position detect and possibly EOS) and a coil besides the disc, and the extra wires go to these. Look at the corresponding score reel for player 2. Great info thanks. So that match unit chassis can be a one way or two way depending on the game and use. Nice to know. For the scoring reel, I was trying to understand the schematic. I have mapped out all 3 switches and coil on the reel, but having trouble putting it together with the schematic. 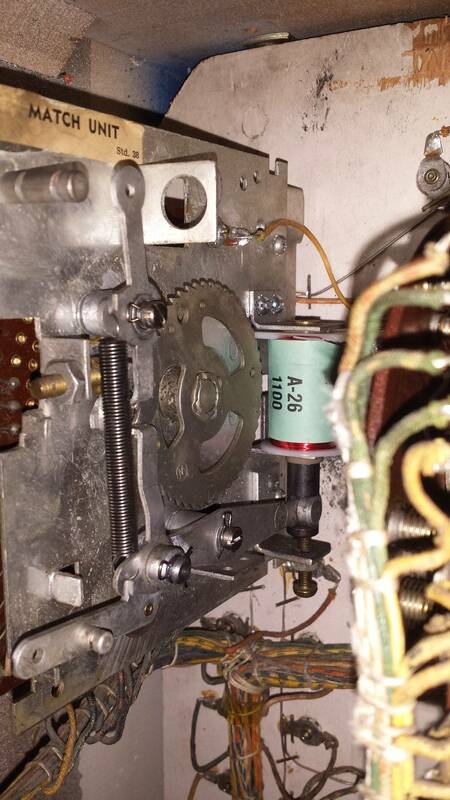 The trouble is the schematic does not treat the switches, coils and terminals on this unit as a single unit. Stuff is spread out and I was hoping I'd just misunderstood the schematic. It is easier to draw the schematic with logical functions, than trying to keep all the connections in one unit together. In later Williams games, there was a section in the manual, that described every relay and unit by their switches. But in 1962 they only included the schematic. Score drum unit switches were usually labeled in 60's schematics as "0-9 EOS SW", "0-9 ZERO SW" and "9 D.U". Try finding the 10 point relay coil in schematic and see what energizes it. The relay of course will operate when any 10 point switch in playfield closes, but also when 1 point is scored and the 0-9 drum is at 9. It takes a while to get familiar with EM operation and schematics, but you will get there. Good luck!